They are more than just poachers…..
We shared the message with the three members of the civil society, including the chef du secteur, who are traveling with us. They are the first official delegation not only to visit our project but even to come to Obenge since the civil war started more than 10 years ago. Maurice greeted us in Obenge that evening with the information that the weapon was with the Mere Cheftaine (village chief). The owner, the uncle of Major Ranger, was under surveillance. 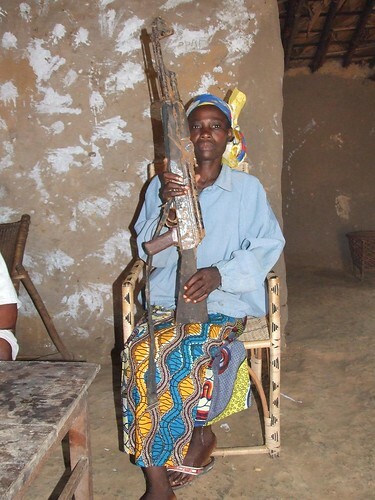 We learned that this uncle had at first refused to reveal the whereabouts of the arm, but when bound and threatened with being hauled before the military unit based in Opala for interrogation, he agreed to lead the village chief and a small group of witnesses to a nearby forest site where the assault rifle was buried. 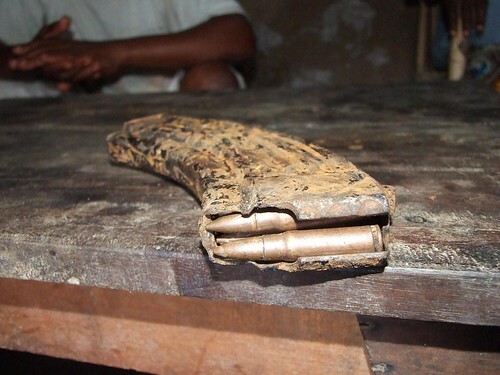 Covered with rust, the stock tunneled by termites, the clip still held four rounds. Kahindo, trained as an ICCN guard to handle firearms inspected the gun the next day and noted that it could still be made operational. Against this background the chef du secteur spoke this morning, at a village reunion of the entire population , well over a hundred were present. The gathering started in the morning with singing and dancing and ended three hours later with a march through the village. To add to the drama, Radio Okapi in a recent national broadcast carried a story about Colonel Thoms, reporting that MONUC investigations revealed that he and his gang had raped at least 135 women and girls, including 25 children. I will have a follow up of the community meetings with more information from John in two days….. This entry was written by Terese Hart, posted on 2008-04-22 at 4:44 pm, filed under About the project, Diamonds, gold and guns. Bookmark the permalink. Follow any comments here with the RSS feed for this post. Post a comment or leave a trackback: Trackback URL. Firing squad or meet the parents of these victims…I opt for the latter.Good to know this weapon is out of commission as well. Recently read a story about a poacher, who then fell victim to a very hungry crocodile…God forgive me, but that is my idea of justice. I agree with you Theresa. I do believe that justice is finally coming to the TL2 but it comes along with the dredging up of some pretty horrific “realities of life” that people just accepted…figuring there was no choice. Makes my blood run cold. Recently discovered the Lomami website. It is excellent! Please keep up the outstanding work despite the difficult odds. Incidentally, although not bonobo related, could we perhaps have some news on how the Itombwe expeditions went? Kim Gjerstad in his now defunct blog gave us a tantalizing glimpse, but it would be great to read something more substantial on that critical part of the D.R.C. and what John and the others found. Yes Greg, certainly. You will not be surprised to know that there is a REPORT almost ready on the last census in Itombwe. I will call John’s attention to your note as further impetus to move this out. There are two sources of possible funding for Itombwe (it will need a good bit). One is Banro a big Candadian gold company mining along Itombwe’s and Luama Kivu’s SW border (if you send your email I will send a map). They have not YET been convinced they have any responsibility here — they need to be. The second source, and more likely I think, although not immediate, is the road reconstruction of RN5 on the eastern side. Western money supports this (World Bank, DFID…) and they will have an environmental component. I hear the lions in the Maasai Mara are hungry. This criminal sounds like a tasty meal. Terese, perhaps we can mount a little campaign to bring the Canadian mining company’s attention to their responsibilities? Itombwe is a wonderful place. Absolutely incredible. 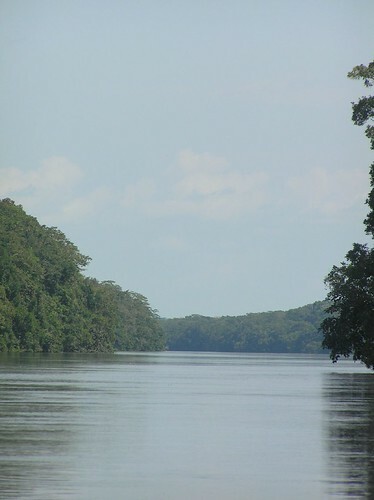 With high altitude forests and alpine ridges and gallery forests AND gorillas. Just to the south and at lower altitude but looking up to Itombwe is the Luama Reserve…virtually unprotected but still with elephants and magnificent. When I was there in November there were orchids (several species) and lilies blooming on the Savanna (tons of them). Of the two people above the first is their man in bukavu and the second their man in Kinshasa. Don’t have contacts for Canada unfortunately. [email protected] and I will send you a map of their operations with respect to protected areas.